If you haven’t yet bought your Christmas pressies, you could do a lot worse than consider teachersource.com as your one-stop shop. I have been using it for years; it’s a fantastic source for science ‘toys’ for your lab, but there’s no reason why you couldn’t use it to stock up on presents for the little ones in your life – ideally they won’t have started secondary school yet so will still be fascinated by Science. In fact this year I pointed the site out to my first and second-years and they have actually used it themselves to order presents. And it’s all Science! One tip: if you opt for the express delivery (via UPS) it’s not only more expensive but you will also be caught for customs duty. Beware! One of the few advantages of the downturn in the US economy is the favourable exchange rate. 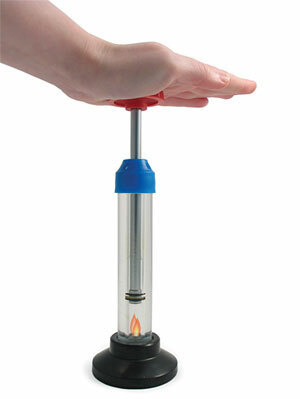 The most impressive Science Shop I have come across is teachersource.com from the good ol’ U S of A.
I must have paid the guts of €40 for the Hyman Fire Piston from TechnologySupplies.co.uk from England, which admittedlyis also a very useful site. Teacher Source has it here for $18.95. Maybe €12 or so? They are also amazingly prompt. I used them quite a few times and delivery is usually within ten days, sometimes even within the week. I did get caught with Customs Tax once though. Loads ‘n loads of cool toys educational resources!